Word is coming out that Land Rover is developing a tuned version of the Evoque. According to a report coming from Autocar, a high performance version of the Range Rover Evoque is on the way. While no exact details or final confirmation has been received as of yet, the latest Land Rover could produce as much as 300hp. The UK-based magazine also said that David Mitchell, program director for the Evoque, confirmed that the British automaker is now testing a prototype and that "the chassis can take" the extra power. 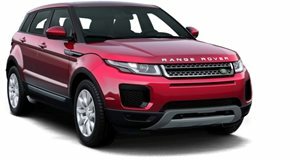 Currently, the Evoque is powered by a 2.0-liter direct-injection turbo four cylinder gasoline engine. In fact, American customers are already familiar with this engine, as it is shared with the Ford Explorer and the upcoming redesigned Escape. Remember, Ford used to own Land Rover so the engine sharing agreement is still in place. It&apos;s also the same engine that powers the also upcoming Focus ST, which has some 250hp. No word has been given regarding a possible launch date or whether it&apos;ll be offered in two or four doors (or both), but we&apos;d imagine Land Rover would want to be quick getting it to market by around next summer.